Doesn’t matter if you were good or bad throughout the year, so long as you placed many wagers with Intertops; join now and claim the Christmas Deposit Bonus. Unwrap your Intertops gift to receive the special Christmas Deposit Bonus that can see you get 50% up to $100 free! This is a limited time offer that lasts until December 31, so you better take advantage of Santa’s goodwill and grab the Xmas Sports Bonus now! Wager the bonus funds on any Intertops market to make even more money over the December festivities; the betting opportunities are endless with the online sportsbook, as you can invest in NFL, European soccer, Basketball, Baseball, Politics and even Entertainment. NOTE: the Christmas Deposit Bonus applied to US and Canadian players only! Back your favourite NFL team to win the Super Bowl outright this season or place a wager on the Coin Toss in the final game. The New England Patriots have been given favourite status +225 (3.25) to win Superb Bowl LI, while the Dallas Cowboys are right behind them with odds of +450 (5.50). Seattle Seahawks are third favorites +600 (7.00) for the prized Vince Lombardy trophy, while the Pittsburgh Steelers +900 (10.00) and the Kansas City Chiefs +1000 (11.00) are underdogs. Use your Christmas Deposit Bonus on the upcoming 89th edition of the Academy Awards and bet on your favourite movie that you think will win the ‘Best Picture’ category and other markets. La La Land is currently ranked as the favourite moving picture -200 (1.50) to win the biggest prize at the Oscars, while Manchester by the Sea is in second place +600 (7.00) and Moonlight is in third spot with odds of +800 (9.00). However, judging by the response La La Land has received so far, we’re thinking it will win the ‘Best Picture’ award. 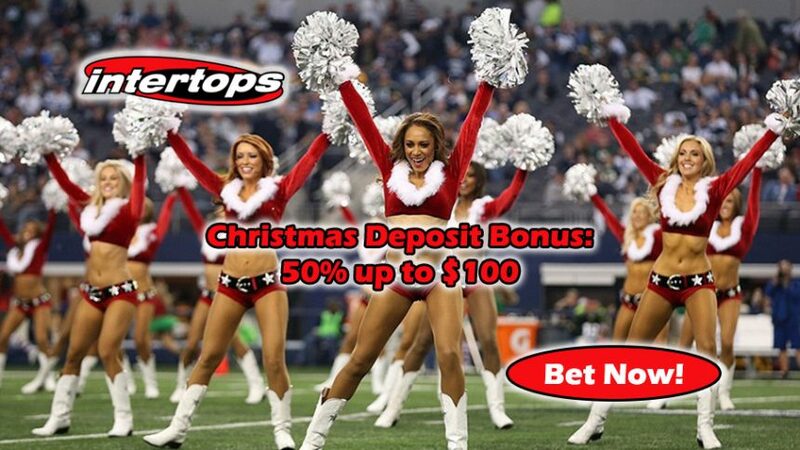 Don’t miss out on this great December opportunity to grab 50% up to $100 free with the Christmas Deposit Bonus! Once you’ve claimed it, don’t forget to maximize your earnings on all the sports action this month. Get your Christmas Deposit Bonus!